Never miss a pop fly, penalty shot, halftime show, or song again. Reserve your parking spot for the big game or concert in Annapolis! Parking is a breeze with ParkMobile. Go online or download the ParkMobile app to reserve Annapolis arena parking today! Get the app for iOS or Android. Can You Find the Best Event & Stadium Parking in Annapolis? You already book plane reservations, hotel reservations, and restaurant reservations. Shouldn't you be able to do the same with event parking in Annapolis? We've solved the parking problems so many big stadiums face. With ParkMobile, you can beat the rush and reserve Annapolis stadium parking ahead of time. 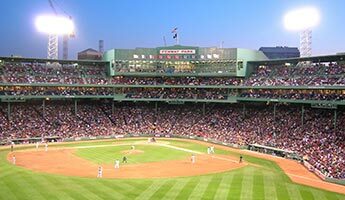 We're the exclusive parking provider for many of the top sports and entertainment venues across the country, which means we've got the hookup when it comes to the best stadium parking in the most convenient areas. How do we make it happen? It's easy as pie! As we mentioned before, you can conveniently reserve and pay for parking ahead of time online. Search for the arena or stadium name, select the event, pick the parking type, pay and gear up for your big event! You'll get the choose between a range of event parking options including parking lots, private garages, and covered parking near the stadium in Annapolis. Book on the same day as your trip or way, way ahead of time. You're in control. ParkMobile always gives you parking options for life's biggest moments. Never let a tiny thing like parking tarnish a concert, festival, convention, or big game. With ParkMobile, arena parking is no longer a mystery. While other fans circle the block looking for parking near the field or arena in Annapolis or wait in a long kiosk line to pay, you can be on the front row— screaming at the opening shot or singing to your favorite tunes. The best fans are always there. They rack up points by reserving event parking ahead of time through ParkMobile! And for fans that tend to leave things to the last minute? They download the ParkMobile app to find and pay for nearby event center parking in Annapolis. In addition to garages and parking lots, the app allows you to choose from covered parking, car parks, street parking, and more! Plus, book parking through the ParkMobile app and you'll know how much time is left on your parking reservation, get alerts before your parking expires, and if needed, extend your session. No payment kiosks, no meters, and no surprises. Just easy parking! Download the ParkMobile app to give pay by phone event parking in Annapolis a try now!